This is the real deal. An Australian grown and made turmeric concentrate. Made to the grower specification to maintain freshness and maximise vitality. Turmeric is harvested and then crushed to release the juice that is the basis of this potent liquid extract. Brilliant. 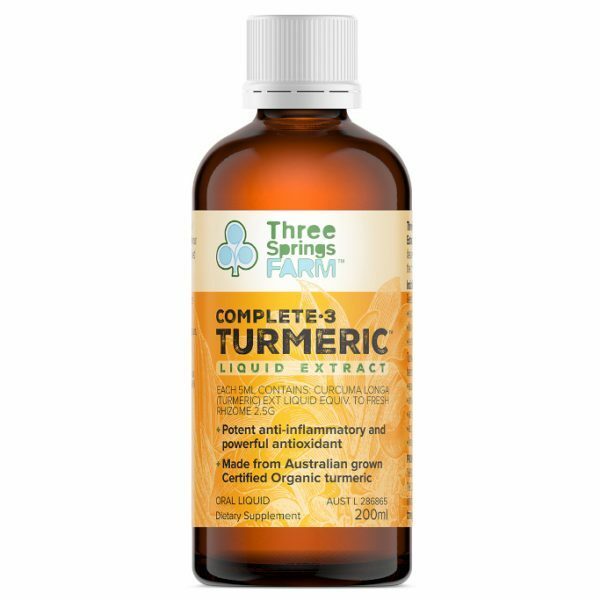 Most turmeric extract available in Australia is made from reconstituted, powdered turmeric. Traditional use of turmeric in India requires the use of fresh spice for maximum flavour and benefit. All Rare Herbs has a long association with Three Springs Farm and are delighted to offer this product. Grown in the fertile soils of northern NSW. Turmeric plants are certified as organic. Buy direct from the grower – the links in this feature will take you to the Three Springs Farm website. Be the first to review “Turmeric, liquid extract” Click here to cancel reply.